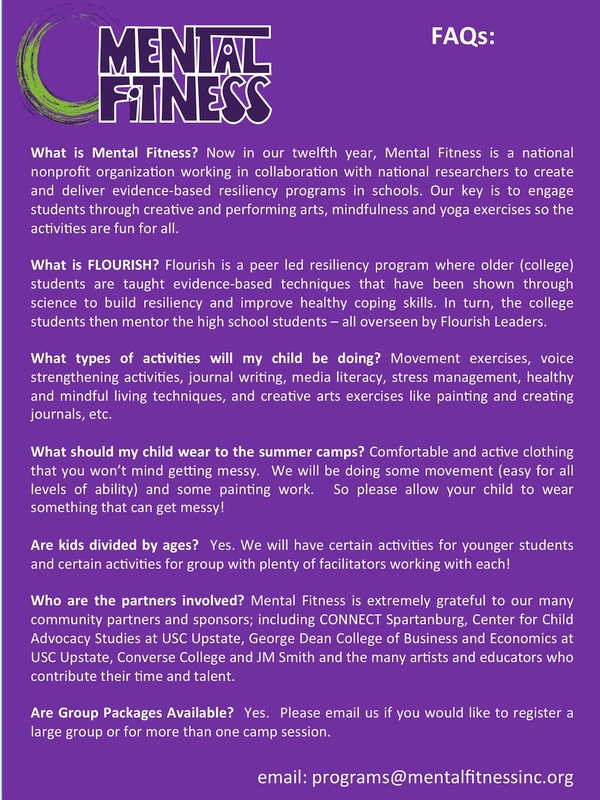 Mental Fitness - August Flourish Summer Camp for Girls! August Flourish Summer Camp for Girls! Flourish is a fun, 2-day camp where girls learn performing and creative arts techniques that help us feel independent and strong -- from the inside out! For girls (rising 6th to 12th graders)! Flourish August Girl Power and Independence Camps at Converse College! Please note, when you register 2 participants at once you will receive a $19 savings! Please use the SAVINGS registration link provided! How to create your own personal journal and affirmation badges! Healthy coping and writing techniques from industry professionals! Breathing techniques that strengthen your voice, speaking and performing arts skills! Simple ways to boost your confidence that will leave you feeling strong and sassy! Improving your dancing skills in a fun setting! Peaceful yoga to improve balance and strength. Fees include lunch, all supplies and other materials needed to FLOURISH! College students from USC Upstate, Wofford and Converse!